Last month, Grain Farmers of Ontario took to the road for the annual January District Grain Committee Meetings. Each district held a meeting to receive reports and elect the District Voting Delegates and GFO Directors for the coming year. A full list of elected delegates and directors will be made available online at www.gfo.ca and in print in the March issue of the Ontario Grain Farmer. Meghan Moran works in the research and market development department at Grain Farmers of Ontario as the research coordinator. In this role, Meghan is responsible for all on-going research projects funded and supported by Grain Farmers of Ontario. She works closely with researchers and other funding partners to ensure all finances are on track and she is responsible for reviewing the reports from each project. Meghan also collaborates closely with the communications department at GFO to ensure that results from completed research projects and updates from ongoing projects are appropriately communicated with our farmer-members. Meghan is well fitted for this position as she comes from an academic background. Prior to working at Grain Farmers of Ontario, Meghan completed her masters in plant agriculture at the University of Guelph. Studying under Drs. Clarence Swanton and Peter Sikkema, Meghan’s research focused on weed control in corn. Specifically, Meghan studied the effectiveness of the herbicide Integrity in corn and herbicide safeners – products that reduce herbicide induced crop injury. Samuel Chan works in the finance department as junior accountant. He is responsible for processing accounts payable and receivables at Grain Farmers of Ontario. He helps with the general accounting needs of the organization and also helps with some of the wheat marketing accounts. Recently, Sam has been taking on more responsibility in the finance department. He is now assisting with bank reconciliation – ensuring monthly budget statements are appropriately balanced. Prior to this position, Sam worked in retail while he pursued the professional designation of Certified Management Accountant. Sam’s education is on-going as he is currently taking classes and building the required experience for the CMA designation. In addition to his on-going studies, Sam holds a degree in marketing management from the University of Guelph. Grain Farmers of Ontario and the Ontario Grain Farmer magazine would like to thank all of the farmers who completed our survey over the past few months. The results are all in and we are currently analyzing the responses. 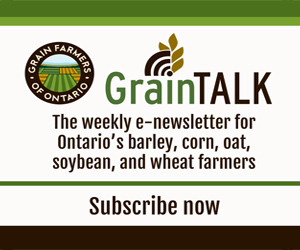 The survey asked for insight into Grain Farmers of Ontario’s activities and the magazine’s editorial content. The results provided by farmers across the province will be used to help drive the direction of the organization and its flagship publication. The decision to focus on agronomy, insect and disease research was made in response from farmers’ requests and identified gaps in Grain Farmers of Ontario’s currently funded research programs. Farmers attending the Annual General Meeting last September filled out a Research Priorities survey asking them to identify the areas of agricultural research that are most important. The results of this survey provide important information for choosing the focus of a call for proposals.